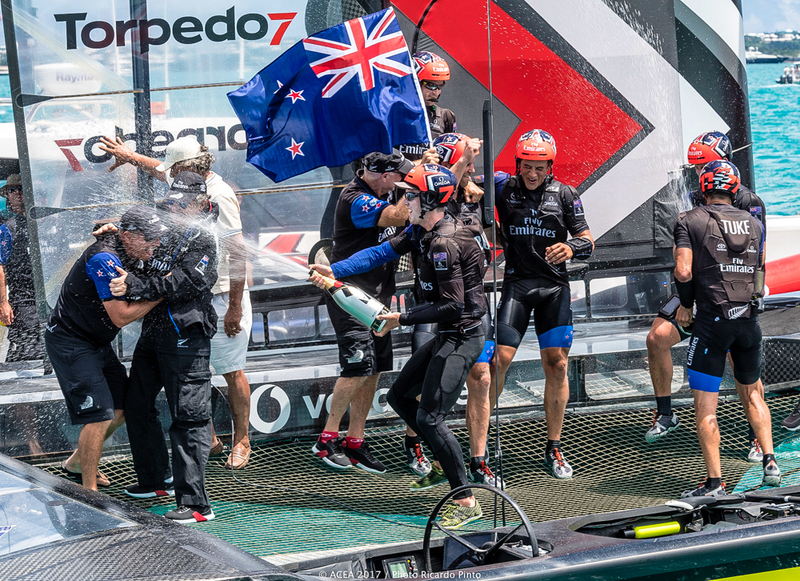 The story of the 2017 America's Cup and Emirates Team New Zealand's amazing win in pictures. 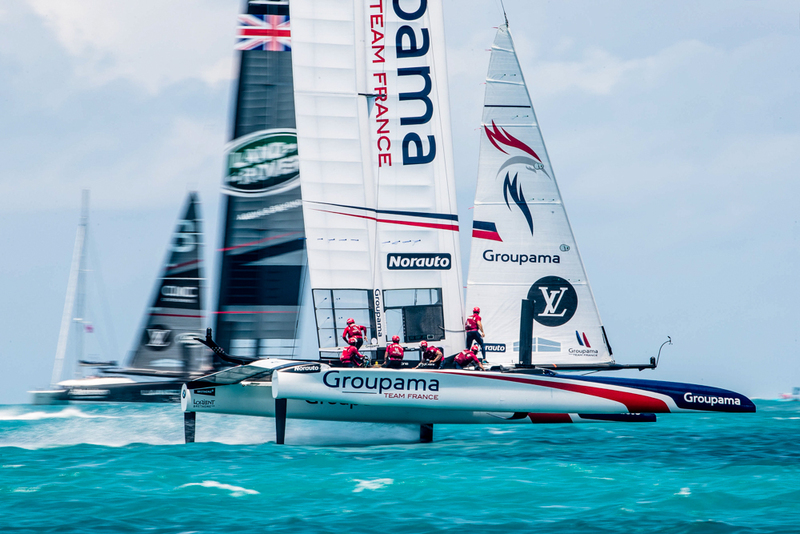 The 2017 America's Cup, the event's 35th edition, saw the highest technology foiling multihulls fighting it out in sunny Bermuda for yachting's ultimate trophy, and an emphatic win for New Zealand, moving the 'Auld Mug' into a new phase in its history. 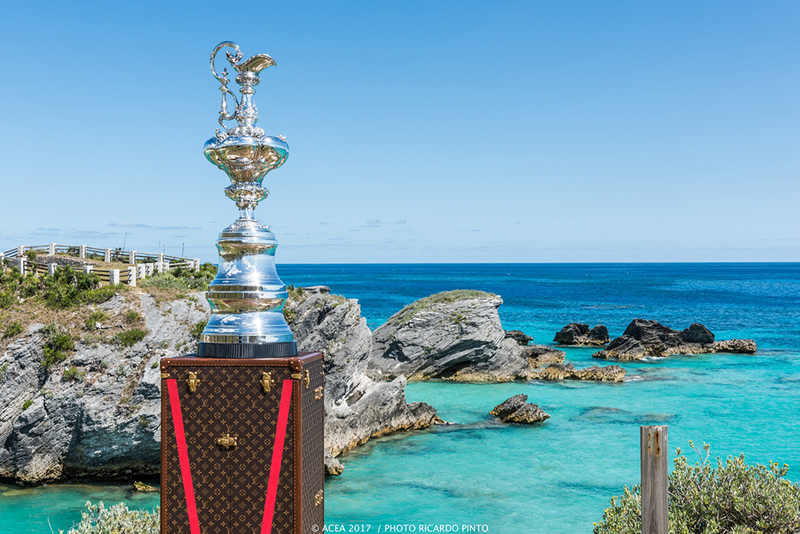 Bermuda proved to be a stunning location for the world's oldest international sporting trophy, delivering blue waters and plenty of dramas. 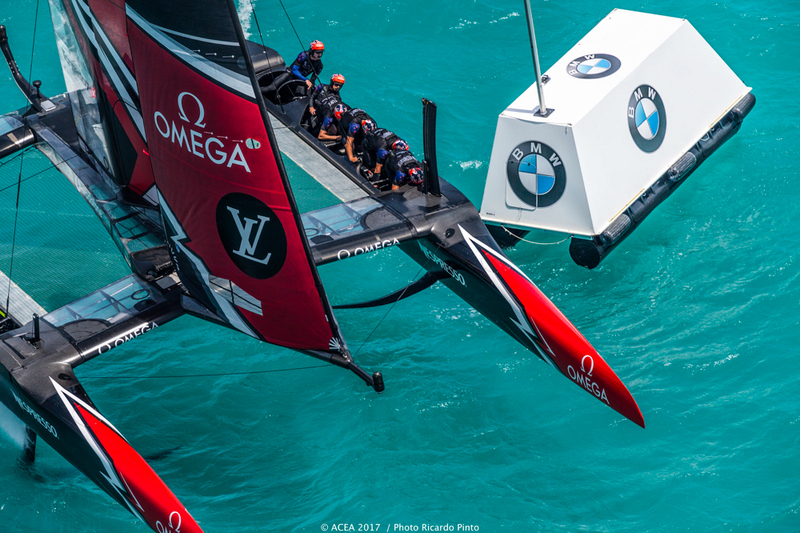 The Louis Vuitton Series decided the Cup challenger to face holders Team Oracle USA in the final America's Cup Match Series. 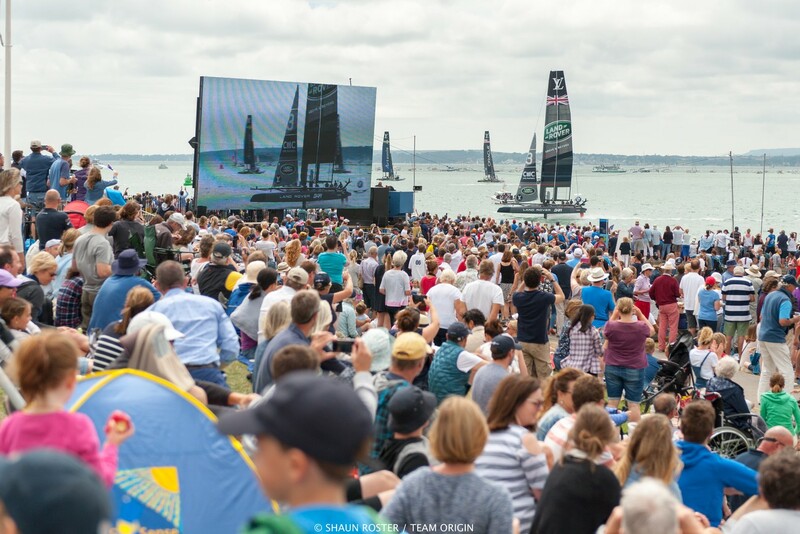 In the intervening years since the 34th America's Cup in 2013, we had enjoyed the added interest of the America's Cup World Series. 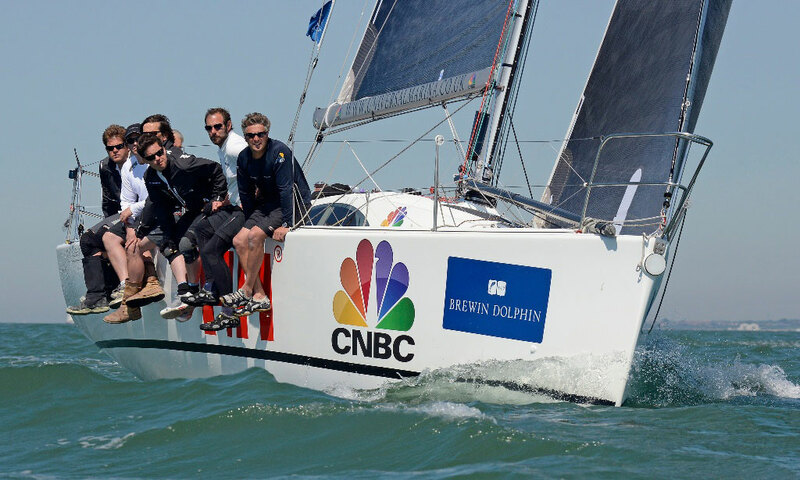 That Series was won by Ben Ainslie's Land Rover BAR team, but his team was unable to get far when it came to the challenger series for the Cup itself; hardly surprising for a new team. They have vowed to return for the 36th edition. The team that eventually won the 'battle of the challengers' was Emirates Team New Zealand, which had so spectacularly taken the Americans to match point four years earlier, before the US team staged its amazing comeback, turning a 1-8 deficit into a 9-8 win to retain the trophy with the help of one Sir Ben Ainslie (see America’s Cup video highlights: the ultimate comeback). Would the 2017 match be a re-run of 2013 but without Sir Ben? 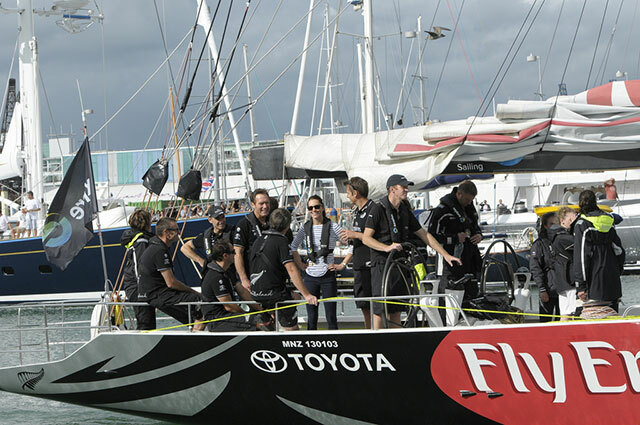 In the first-to-seven match racing series, Oracle started with a one-point advantage due to 'winning' the challenger series, which effectively meant the New Zealand team had to win eight races to take the title. 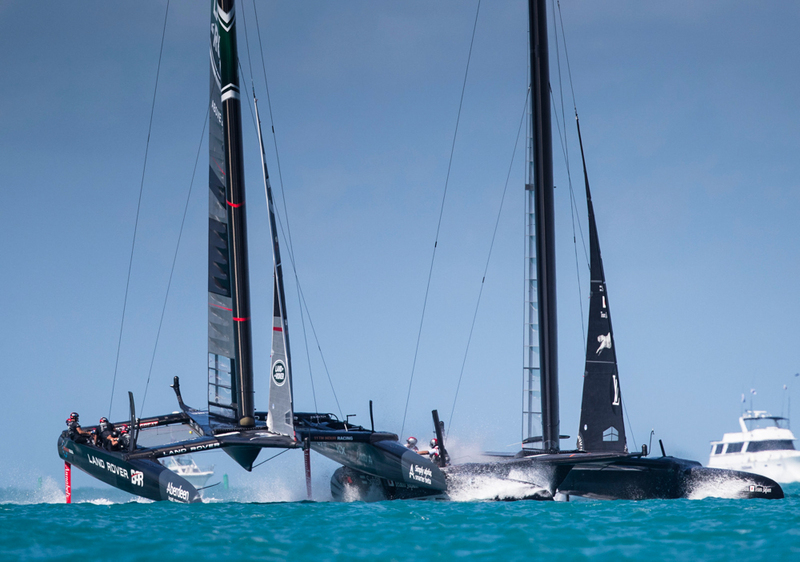 The young talented Team New Zealand team, with 49er Olympic gold medal-winning ace Peter Burling on the helm, stormed into an early lead, taking the first four races over the first weekend of racing, to lead 3-0. There then followed a five-day break from racing, which must have felt frustrating for the Kiwis, but a welcome respite for the US team. 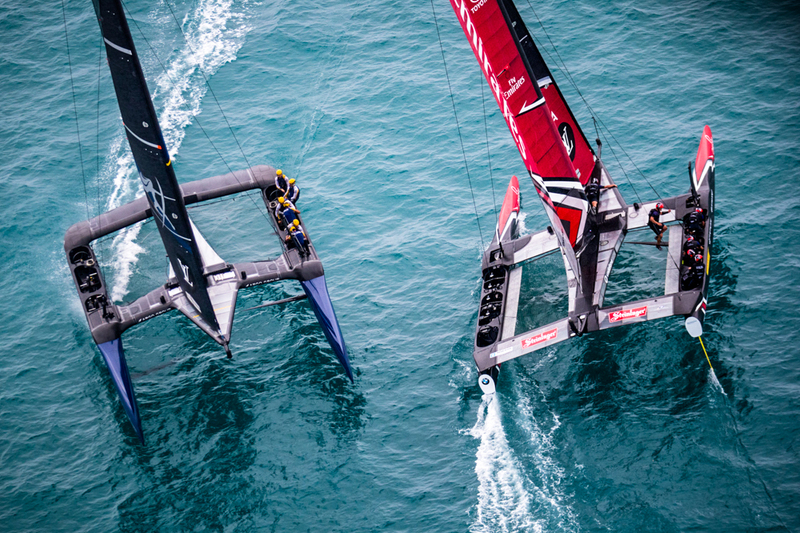 The Kiwis started the second weekend with a win, but then Oracle found some speed and pulled a race back. It was to prove but a momentary blip. 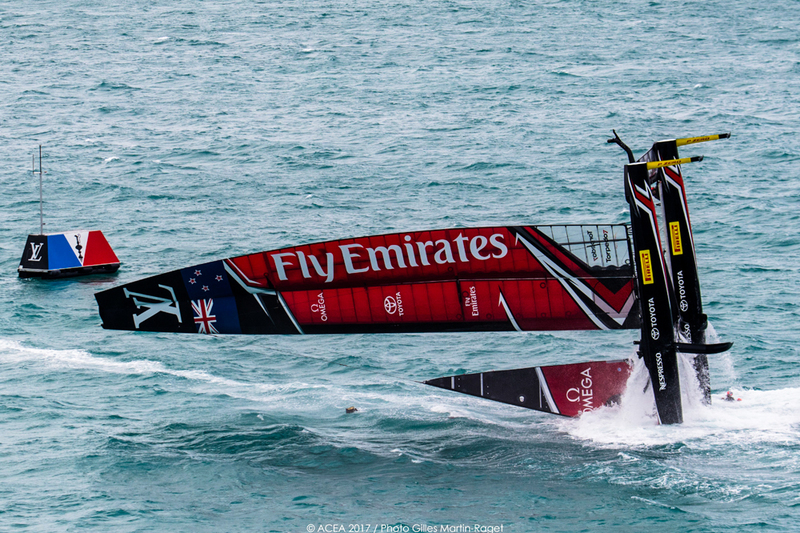 The next day saw two more straight wins for Emirates Team New Zealand, putting them on match point going into Monday's racing. They only needed one race to seal their victory in emphatic style, the official scoreline 7-1, the America's Cup headed once again to New Zealand, where it had spent eight years from 1995 through to 2003. In winning the trophy, Olympic 49er gold medallist in 2016, Peter Burling, becomes the youngest America's Cup skipper in the event's history, and New Zealand can finally put to rest the heartbreak of 2013. 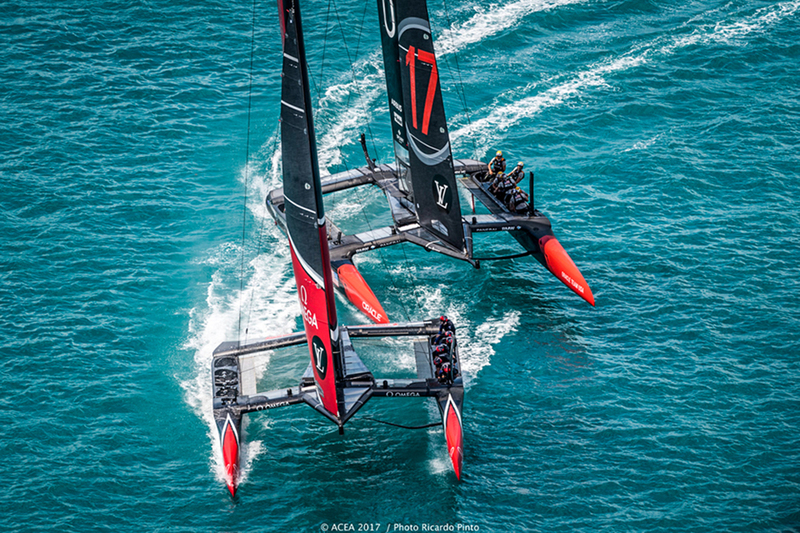 See the story of the 2017 America's Cup below through the stunning photos of the event, carefully selected by our friendly picture guru Tom Gruitt. Groupama Team France never quite had the speed against other boats but battled hard when they could beating Artemis Racing and Land Rover BAR in a few races. 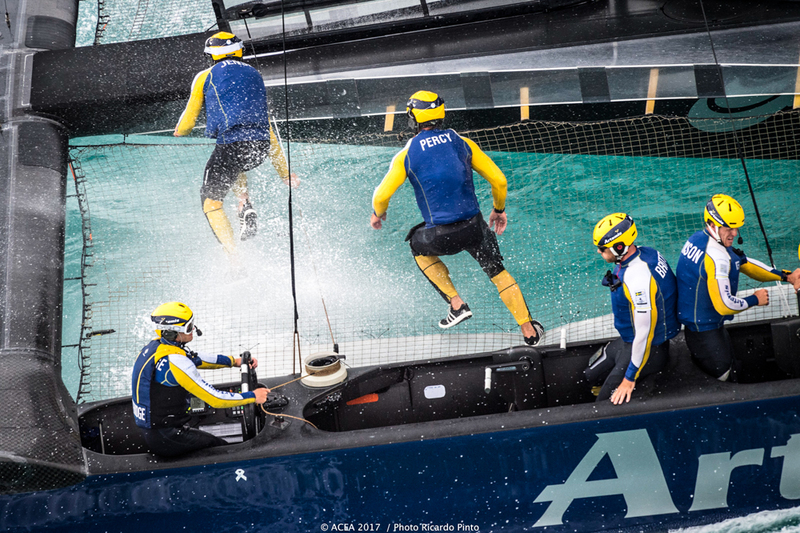 They were the first boat to be eliminated so didn’t make it through to the Louis Vuitton America’s Cup Challenger Playoffs but according to helmsman Franck Cammas, they will leave a smile on their faces. Photo: Groupama Team France/Eloi Stichelbaut. Ben Ainslie nearly ended Land Rover BAR’s campaign on the first day of racing after a nasty collision with Softbank Team Japan. The Japanese team had to take evasive action to prevent a worse outcome, Land Rover BAR punctured the port hull and nearly sank. Photo Mark Lloyd/Lloyd Images. 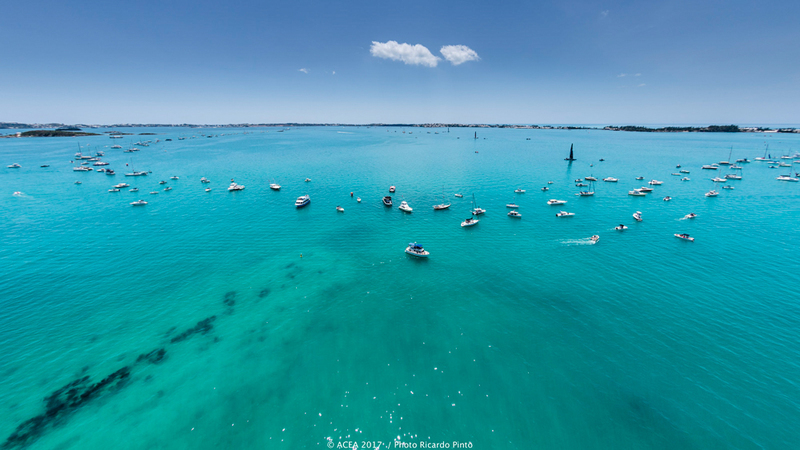 A beautiful view from the helicopter of the ‘Great Sound’ where spectator boats line the perimeter of the race course. Photo: ACEA 2017/Ricardo Pinto. Emirates Team New Zealand with 26-year-old Peter Burling on the helm showing that even when heading around the leeward mark at around 40 knots, they can still manoeuvre tightly to head back upwind. Photo: ACEA 2017/Ricardo Pinto. 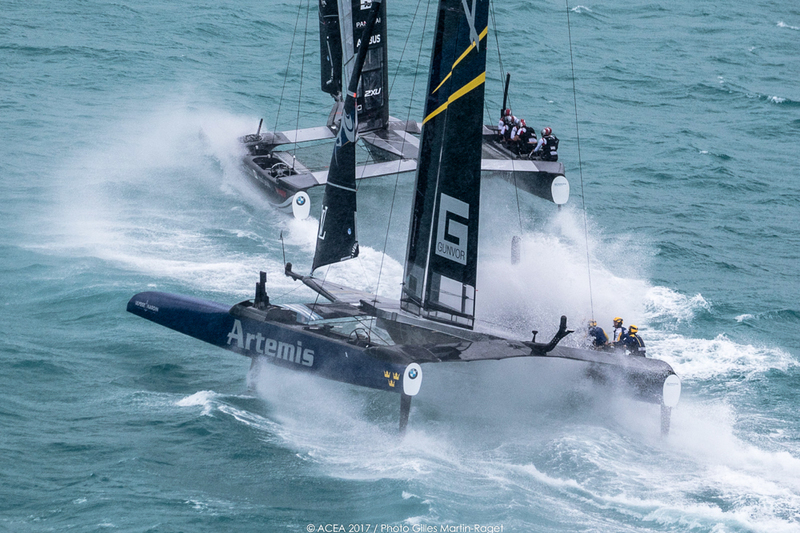 Artemis Racing and Softbank Team Japan head for the bear away at the top mark in winds that are hitting the upper limit allowed for racing on day three of the playoff semi-finals. Correct hydrofoil choice and precise control seemed to be key in the big winds. Photo: ACEA 2017/Gilles Martin-Raget. Emirates Team New Zealand pushed hard from race one and dominated, but they pushed a little too hard powering up over the start line on day three, which resulted in a massive pitch pole. Thankfully all the crew members were fine, but the wing sail was in bits after hitting the water extremely hard. The shore crew put many hours in to fix it and get the boat going even faster for the next race a few days later. Photo: ACEA 2017/Gilles Martin-Raget. 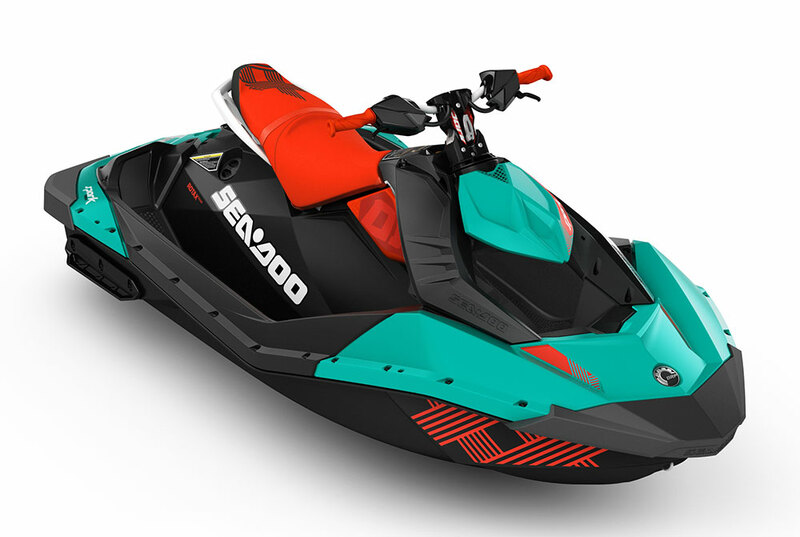 Each team used a different way of controlling the hydrofoils, on Softbank Team Japan, Dean Barker is desperately pressing a button on the wheel to avoid a splashdown, but the crew get absolutely hosed. Helming and adjusting foils at the same time doesn’t seem to be an easy thing to do. Photo: ACEA 2017/Ricardo Pinto. 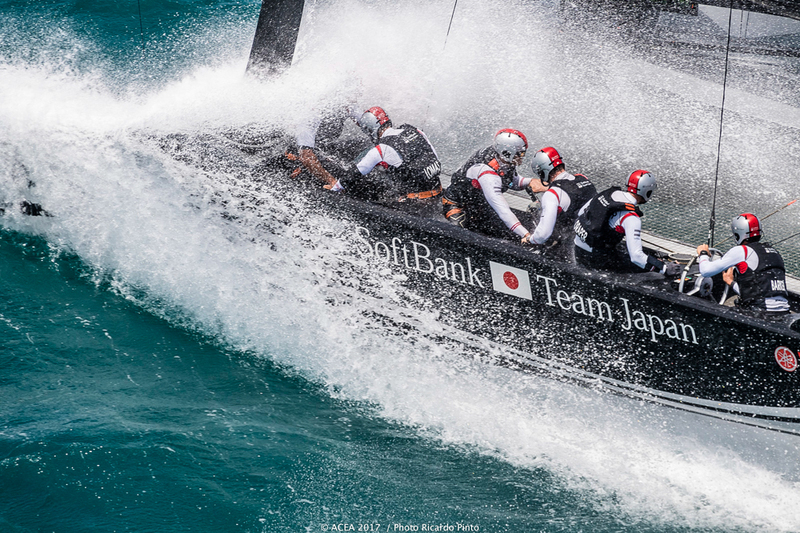 Onboard Softbank Team Japan. Nathan Outteridge prepares to fly the boat in to a tack, while Iain Jensen and Iain Percy run to take control on the new windward side. Photo: ACEA 2017/Ricardo Pinto. A dial down by Emirates Team New Zealand forces Artemis Racing to bear away, but this move in the light wind race gave Artemis Racing the chance to get up on the foils again and get ahead, while Emirates Team New Zealand remains slow in the water. Jimmy Spithill, Oracle Team USA's helmsman, is known for his aggressive style of sailing. Picking a favoured wind shift Oracle Team USA here, managed to get right on the stern of Emirates Team New Zealand with Jimmy trying to force them into a mistake. Photo: ACEA 2017/Ricardo Pinto. 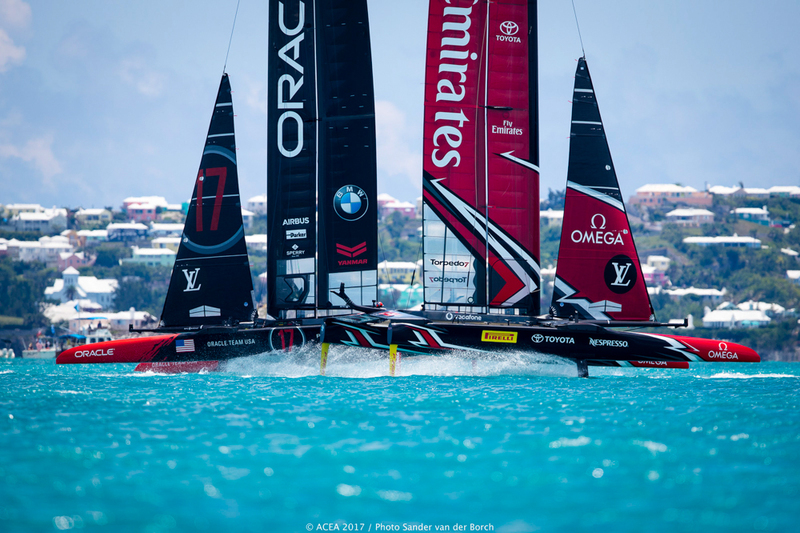 Oracle could only take one race from Emirates Team New Zealand - it was an impressive display of dominance. Photo ACEA 2017/Sander Van Der Borch. In winning, Peter Burling becomes the youngest skipper in America's Cup history. Photo ACEA 2017/Ricardo Pinto. The America's Cup finally finds its way into the arms of Emirates Team New Zealand boss Grant Dalton, who had worked so hard for so long to win the trophy back. Photo ACEA 2017/Giles Martin-Raget. The protocol for the 36th America's Cup has yet to be announced, but it is likely that the competition will take place in Auckland, where the America's Cup spent eight years of its life between 1995 and 2003. While Australia became the very first foreign nation to wrest the America's Cup away from the USA in 1983, New Zealand became the first non-US team to successfully defend the Cup, when they won it from the US in 1985, defending it in 2000, before losing it in 2003. While Newport, Rhode Island in the US is undoubtedly the home where the Cup has spent by far the largest part of its life, Auckland is akin to its 'second home'. Surrounded by water, sailing is a national sport for the Kiwis and the event has always been treated with the reverence it deserves. 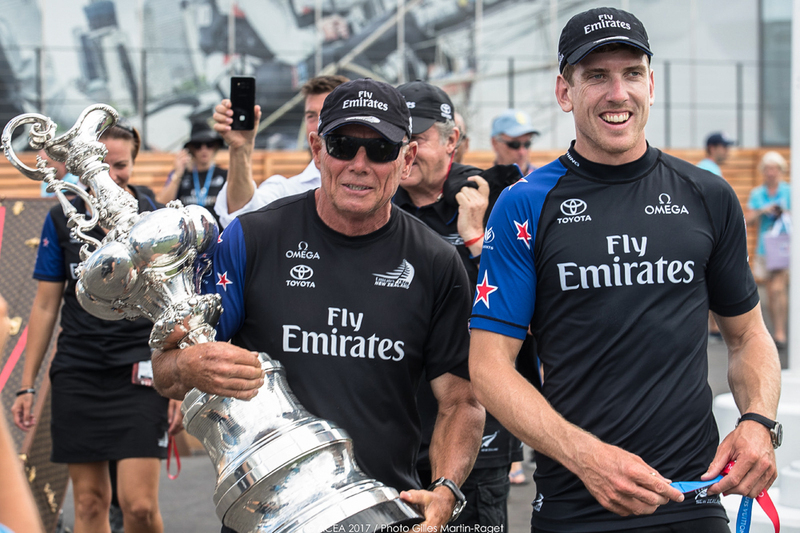 In winning the 2017 Cup, the Royal New Zealand Yacht Squadron becomes the first Yacht Club to successfully challenge for the America's Cup twice. 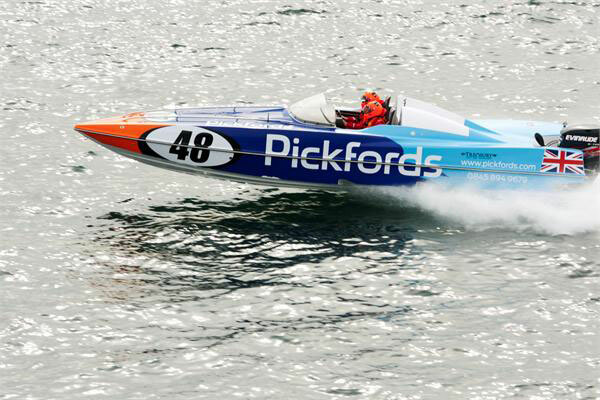 The 'Challenger of Record' - a challenge from a foreign team which sets the wheels in motion for next Cup - was received as the teams hit the shore. 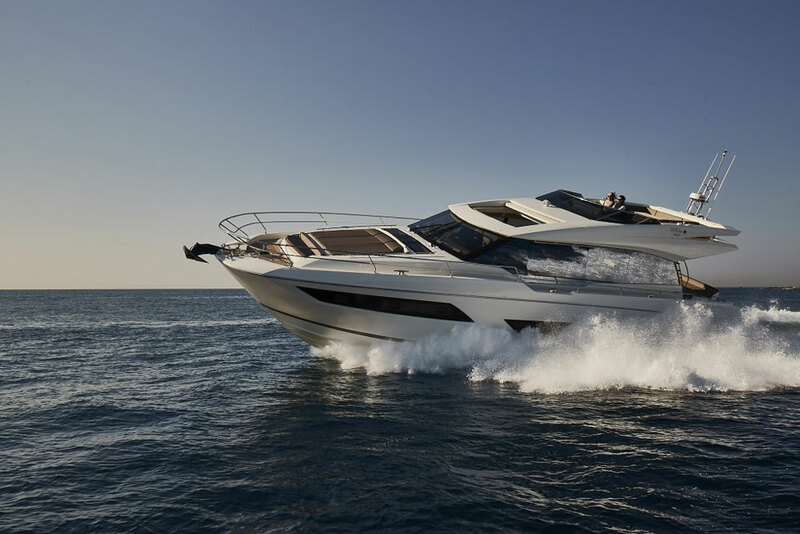 The first team to challenge was Italy's Luna Rossa, and it is they who will help to draw up the format for the next event, with an announcement rumoured to be due in the next few weeks.